HRV and long life - what's the connection? 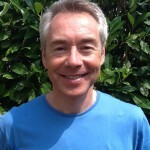 HRV and long life – what’s the connection? Whilst it has long been known that low heart rate variability (HRV) is associated with increased mortality, it was only relatively recently that the association between HRV and lifespan has been systematically studied across a wide range. 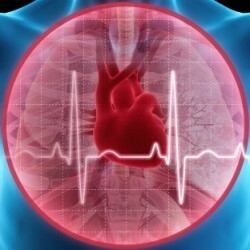 Researchers in Geriatric Medicine and Cardiology at the Chicago College of Medicine identified a need to better understand the physiologic markers predictive of healthy longevity, and suspected that preservation of good function of the autonomic nervous system, that regulates many of the body’s internal processes, might be important. They recruited nearly 350 healthy subjects of both sexes ranging in age from 10 to 99 years around Chicago and in Northern California, and used Holter monitors (portable ECG) to calculate 4 different measures (below) of HRV to a clinical accuracy for a 24 hr period. A time domain measure of parasympathetic (rest & digest) branch of the nervous system. This measures how active/dominant the parasympathetic branch is. Another measure to gauge parasympathetic branch activity. These measures combine parasympathetic and sympathetic influences on HRV. The two measures of parasympathetic HRV (rest & recovery) exhibited a rapid decline between the ages of 20 and 50. The rate of decrease then slowed, reaching a minimum in the late 70s. After this, they found an increase in HRV for the very oldest subjects. 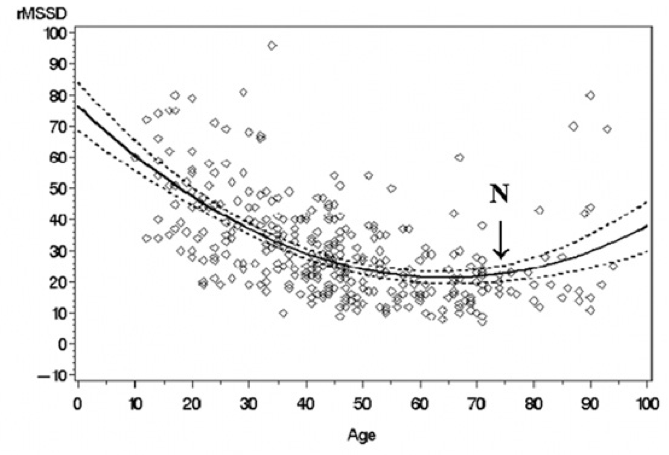 Measures of overall HRV, such as SDNN exhibited a steady decline throughout life, with no upward trend in the oldest groups. The chart below shows the individual data points for each subject using parasympathetic HRV measure RMSSD (the same one used in ithlete – but be careful as the scales are not directly comparable). As well as the overall trend, the wide distribution of values within a given age group should be noted – making it difficult to give age group norms for HRV. The fact that HRV declines throughout life for the population as a whole suggests that preservation of autonomic function could be important to healthy survival into old age. It is especially interesting to see the higher values of parasympathetic HRV in the very oldest members of society. The authors offer a couple of different explanations as to why this might be: 1) That only the people with high levels of HRV in their younger years survive longer than average or 2) That lifestyle modifications (i.e. healthy living) help preserve autonomic functions into later life. It’s also interesting that beyond the age of 50, HRV distribution seems to bottom out. In other research papers, a level of less than 15ms RMSSD has been suggested as a level below which mortality risk increases. The good news is that by frequent monitoring of HRV with ithlete, you can find out what works for you to preserve and even increase your HRV despite advancing years!